Few people from any generation spend 50 years working for a single employer. These days, five months seems a long stretch for some; clearly not for Al Young. 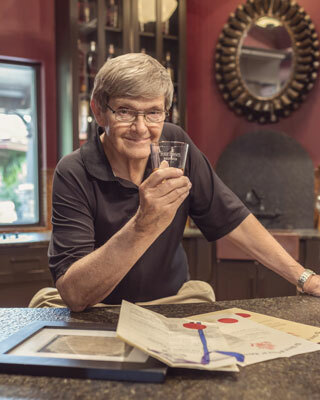 When a newlywed in 1967, he was a bottom-rung clock puncher at Four Roses Bourbon Distillery who would go on to become its Lawrenceburg, Ky., distillery manager, and the brand’s lead ambassador in 2007. In his work, Young has earned the love of his Four Roses peers and bourbon fans across America. As the brand’s chief storyteller and archivist, his baritone pipes rarely get a rest from task of sharing the history of this storied brand. So, it seems only fitting that Four Roses would release a bourbon honoring him and his career—which isn’t ending, by the way. Nose: Just delicious: toffee followed by green apple followed by maple syrup, toasted wheat bread and magnolia bloom. As it opens up, cereal grains arrive, followed by sawn cedar, bourbon ball candy and packaged chocolate chip cookies. Palate: This doesn’t drink like a 108.9 proof bourbon, especially a Four Roses bourbon of such proof. Some of the distillery’s high-rye recipes positively vibrate with aggressive spiciness (which I like, though in small doses or with ice), yet were one able to convert silk to liquid, this is what it would feel like at the midpalate. As revealed on the nose, the whiskey delivers on toffee, maple syrup, cotton candy, ripe apple and a bit of banana before returning to rye on the finish. It belies its age on the finish, which is barely dry and only mildly tannic. It is bourbon through and through, redolent with caramel and citrus and oak; dignified and complex, yet ever comprehendible. Just like Al Young himself. My take: $150 easily qualifies this as a super-premium category offering, but if you’ve got the urge to splurge, put this one on the list. I’ve tasted many similarly priced whiskies this year that don’t stand up to this one. Consider it a great buy—if you can find it. It’s proven over and over that context has a profound effect on the taste of what we drink. That sense of place, or people with whom you experience something, a special date, the angle of the sun … they all influence our flavor memories in inexplicable ways. So getting a big sip of Four Roses’ 2015 Limited Edition Small Batch last July in the Lawrenceburg, Ky., distillery’s sensory evaluation lab—and poured by new master distiller Brent Elliott from a marked lab bottle, not a pretty bourbon vessel—helped pile up the experiential points on my palate to make that a significant memory. And surely it made the whiskey taste better, though it didn’t need it. It was strikingly good that afternoon, and as I sipped it, I planned how to get my hands on a bottle of it when it became available two months later. In late September I landed just one, a $129 purchase split between me and two Four Roses fans. We poured about a half ounce, sniffed, tasted and … stopped. Straight out of the bottle it was hot, simultaneously fruity and fiery—far hotter than I remembered tasting in the lab and far spicier than I expected at 108.5 proof. High-proof liquor generally needs a rest in the glass anyway, so we walked away for a spell, let it air out and nibbled on some fatty country ham. After several minutes we returned to the glass to find aromas of spearmint, cedar, oak and vanilla, no looming pepper to warn a further rest was required. So we sipped again and got toasted marshmallow, caramel and cinnamon all over the exhale. More waiting and more small sips followed, and fruit showed up: apple and cherry in particular. The finish was fairly short and dry, and the descent delivered a warm burst down the pipe. I liked it, a lot in fact, but I wasn’t wowed by it as I was in the lab. So I corked the bottle and shelved it for later. About a week later, when a 3-ounce press sample arrived, I took it to my office and let it sit on the desk, unopened, for several days. I knew some business colleagues would stop by over the following week, so I planned to share it with them and get their opinions. 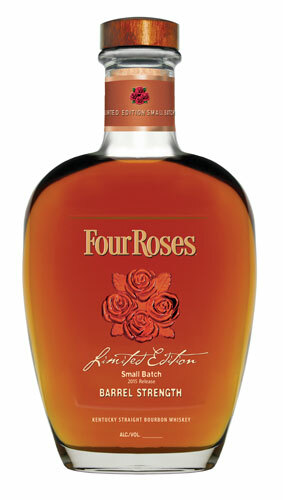 When I cracked open the mini-bottle, out came the standard and formidable oak notes you expect from Four Roses. Sips brought on some more nuanced flavors like toffee and dark brown sugar. One whiskey wonk friend studied it carefully before mumbling, “Juicy Fruit,” referring to the popular Wrigley’s gum. He was right. A day later I smelled the empty, dry glass on my desk and got notes of toasted marshmallow and graham cracker—yeah, I’d have given anything for a stack of warm s’mores at that moment. But I settled for another tiny pour, maybe a quarter ounce, and sipped it. Still flavorful, but still hot. I added a few generous drops of water to open it up—and then kicked myself for waiting so long. Immediately, aromas of toffee, cherry and pipe tobacco curled up and out of the glass, and a small sip dropped off deep cherry and oak notes at the midpalate. A little leather and tannin arrived to play on the exhale, making this once confounding (to my taste) bourbon a real delight. Most stunning was the change in texture: a little water turned the mouthfeel into light honey syrup: silky and soothing as a toddy. My best guess was I’d knocked the proof down to just above 90, which softening it a good deal without removing all its bite. I attach no pride to the fact that my palate favors high-proof whiskies over lower ones, but this one certainly turned that notion on its head. I was sorry once again that I’d waited so long to proof it down. As the last official “FR-LR” created under the direction of now-retired master distiller Jim Rutledge, I’d say it’s worth finding if you can. Get at least a pour of it at a bar if you can’t find a bottle. For what it’s worth, I’d strongly suggest two Four Roses private selection bottles chosen by Rutledge: the OBSO and the OESV, both of which were available only in the gift shop this fall. At $72 each, they’re not cheap, but they are phenomenal. Interestingly, they’re both higher proof than the 2015 LR (112.6 proof and 112.4 proof respectively), but they drink softer than the 108 proof. However, both private selections are younger whiskies (11 years and 9 years respectively), versus the much older blends in this year’s Small Batch: a 16 year-old OBSK; an 11 year-old OBSV; a 15 year-old OESK; and a 14 year-old OESK. So perhaps it’s old bourbon that ignites my taste buds? I’ll happily commit myself to further research. When Brent Elliott learned in June that he’d be the next master distiller at Four Roses Bourbon, the news was delivered with about as much ceremony as a dictated memo. His bosses called him to a meeting in which he was told the brand’s veteran master distiller, Jim Rutledge, would retire at the end of August and that Elliott would be his replacement. Despite the significance of the news, there was no celebration or shared cigars or congratulatory dinner of cracked crab and Cabernet. Recalling it, Elliott describes it as less an offer of promotion and more a verbal update to his current job description.